Note: the screen captures accompanying this review are taken from the DVD portion of Pete's Dragon: 35th Anniversary Edition. Disney trotted out all the "Brazzle Dazzle" they could muster for Pete's Dragon, its big offering for the 1977 holiday season. I was a nine year-old Disney freak when it first came out, so of course my family had to go see it. Back then, while I remember having fun, the movie also left me with vague feelings of disappointment and exhaustion - it was too chaotic, and there wasn't enough of the dragon (honestly, if you're gonna call something Pete's Dragon, you better have some major dragon action). The experience probably didn't dash my childhood dream of someday becoming a Disney animator, but even as a kid I was keenly aware that Pete's Dragon proved that Disney's glory days were behind them. 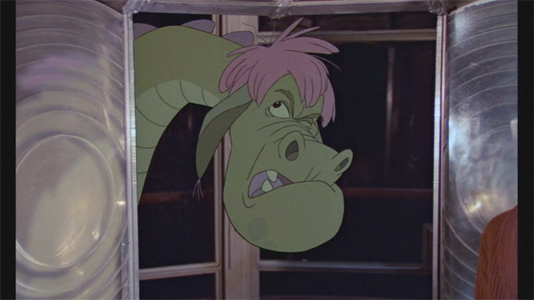 The dragon in question, a friendly, puppy doggish green and pink lump named Elliott (voiced by Charlie Callas) serves as the loyal best buddy to Pete (Sean Marshall), a tow-headed orphan living in the backwoods of early 20th-century Maine. When the film opens, they are being pursued by a nasty bunch of hillbillies, the Gogans (headed by Shelley Winters), who want him back simply because they paid for him. 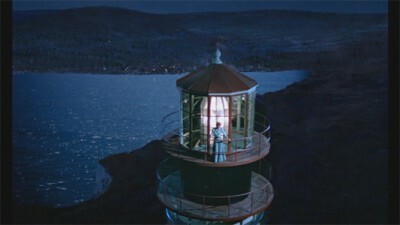 Pete and Elliott, who makes himself invisible to most human eyes, escape to the coastal town of Passamoquoddy (the name factors in one of the script's lamer recurring jokes). They find, however, that they are as unwelcome there as with the nasty Gogans. Pete nevertheless finds shelter in the home of the town's warm-hearted lighthouse keeper, Nora (Helen Reddy), and Nora's eccentric, tippling pop, Lampie (Mickey Rooney). 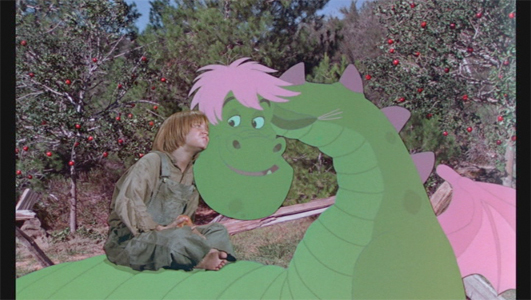 While a lot of the tension in Pete's Dragon lies in Pete's attempts to convince everyone that Elliott is real (there's also a bit about Nora pining for her lover, lost at sea, which ties into the movie's vague "believe in yourself" theme), most of the film consists of either broad slapstick comedy or shrill musical numbers. If The Apple Dumpling Gang and Mary Poppins had a baby, it would look something like this. 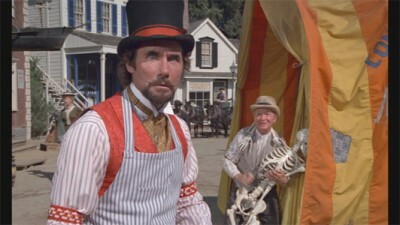 The wacky shenanigans are especially laid on thick with the arrival in town of a pair of traveling medicine men, Dr. Terminus (Jim Dale) and Hoagy (Red Buttons), shysters who take a special interest in Pete and Elliott when they find out how valuable dragon parts are. With a small army of incensed townspeople, bloodthirsty hucksters, and those darn hillbillies intent on wreaking havoc on poor Pete and Elliott, it's a wonder that anything gets resolved. Eventually, things do come to a happy ending. Since it takes more than two hours to get there, however, you may find yourself more relieved than pleased once it's all done. Overall, Pete's Dragon isn't a bad film. It's just bloated, overlong and (as in 1977) exhausting. With its abundance of scissor-edged process shots, painterly matte art, and studio-bound activity, the movie has its own interest as quaint, last-gasp evidence of old-style Disney clinging to tradition. The formula had definitely run thin, however. The film gives off the feel of being sloppily directed and unsure of which direction to take (less ambitious Disney efforts of the era, like The Cat from Outer Space, seems sleekly efficient by comparison). That slipshod approach is reflected in the cast's performances, which fall into the flat/generic (Reddy and Marshall, who comes across like a '70s boy version of Mary Poppins' Karen Dotrice) or hammy/overbearing (Rooney and Buttons). Jim Dale fares the most positively, bringing the right blend of performing chops and theatrical flair to the snaky Dr. Terminus. As for the dragon, Elliott comes across as beautifully animated (really, Don Bluth's expressive animation here is brilliant) - yet something of a big, dumb cypher. 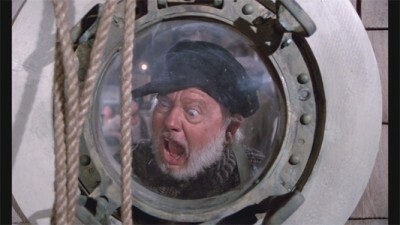 It doesn't come as a surprise that Disney didn't do much with Elliott beyond this film, other than making him a float in their theme parks' Main Street Electrical Parade. The musical score, by songwriters Al Kasha and Joel Hirschhorn (the same team who wrote The Poseidon Adventure's Oscar-winning "The Morning After"), has its share of forgettable numbers, but I admire the eclectic approach they took here, turning in perky tunes influenced by '60s Pop, Tin Pan Alley and Country-Western. They do especially well with Helen Reddy's big ballad "Candle On The Water," which is lovingly staged atop a lighthouse at night. It's actually one of the few genuine, contemplative moments in the film. For the most part, however, the musical numbers are shrill, overproduced set pieces that bog down the momentum. I was amused by how the waltz-timed number about togetherness has a striking similarity to "The World Is A Circle" from Ross Hunter's musical stinkeroo Lost Horizon. 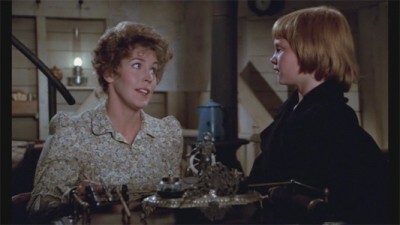 By the time Pete's Dragon lumbered on to the "We're A Family, Let's Paint A Lighthouse" and "We Bought That Kid, Give It Back" numbers, however, I frankly lost interest. Disney's arbitrarily chosen 35th Anniversary Edition of Pete's Dragon comes as a two disc combo pack, with identical Blu-ray and DVD editions of the film housed in a snap-case with metallic paperboard slipcover. Be aware that the packaging and disc labels erroneously give the film's running time as 88 minutes; the actual film is the same two hour, eight minute version from previous home video editions. Disney trumpets this version as a "new enhanced digital restoration," and it looks good. While I didn't have the 2009 High Flying Edition DVD on hand to compare, the 1.66:1 picture is nicely mastered and a huge, huge improvement over the grainy, pale job on their 2001 Gold Collection DVD. The picture is keyed a little too lightly in the dark scenes, and seems to sport a green tinge at times, otherwise it's a pleasant, professionally done transfer. The HD Master Audio on the Blu-ray is a nicely done effort that showcases clearly mixed dialogue and music without either element overwhelming each other. A French dub of the soundtrack is also provided in 5.1 Dolby. Optional subtitles are included in English for the hearing impaired, French and Spanish. Brazzle Dazzle Effects: Behind Disney's Movie Magic (25:25). Sean Marshall narrates this featurette, which serves as part nostalgic making-of, part documentary on the Disney studio's experiments with combining live action and animation going all the way back to the silent Alice shorts. Deleted Sequence: Terminus & Hoagy Hunt Elliott (2:27). A slight scene, illustrated with storyboard sketches. Original Song Concept: "Boo Bop Bopbop Bop (I Love You, Too)" (2:36). Scored with a re-arranged version of the tune, this early story board sequence treats the tune in a more ambitious manner - which likely would have been out of place in the final cut (it's a trip, however). Trailers for this film and (but of course) other Disney offerings round out the extras. The Blu-ray's extras are simply repeated on the DVD edition. It's hard to judge something like Pete's Dragon impartially, since it falls in the nostalgic Disney of this reviewer's childhood encompassing Robin Hood (1973) through The Fox and the Hound (1981). While it has its charms (the score, the animation on the dragon), the film is too bloated, messy and unsure of itself. The filmmakers apparently couldn't decide whether to make it a timeless family musical or a broad comedy, which ultimately sinks it. While it's nice to have the film in HD for the 35th Anniversary Blu-ray, the disappointing void of bonus content and slipshod packaging make this a non-essential purchase - even for Disney nuts like me. Rent It.